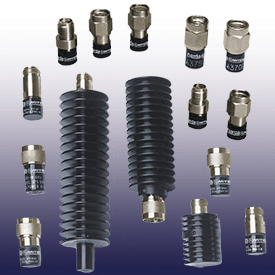 L3 Narda-MITEQ offers a large variety of coaxial and waveguide terminations and dummy loads which meet the requirements of all microwave measurement systems and most other applications for high quality loads. The many types of coaxial fixed terminations range from small ½ watt instrument loads to 500 watt loads to terminate high power transmitters. Medium power loads (10 to 40 watts with low VSWR) are used in many system and measurement applications. High power dummy loads with cooling fins of unique design provide optimum dissipation of large amounts of microwave power. To view application notes for Terminations, please click here. To view or download information on specific Narda-MITEQ Models, please click on one of the sub-categories in the links below.